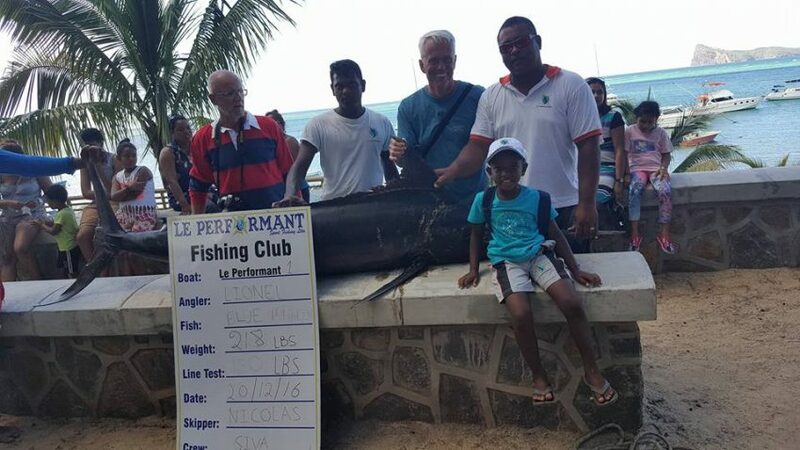 The young Matis and his dad who were in holidays in Mauritius, had chosen Le Performant Fishing Club to try their Big Game Fishing. On the 29 DEC 2016, they rent our boat “LE PERFFORMANT 1” and caught 1 Blue Marlin of 147 LBS and 1 Spearfish of 24 LBS. The skipper was Nicolas and helped by Siva; member of the crew. Our Vessel ”LE PERFORMANT 1″ caught 1 Blue Marlin 218 LBS on 20/12/16 with 2 Dorados and 3 Bonitos. The Skipper was Nicolas along with Damen and Siva as crew. Our Anglers was Lionel & Thierry. 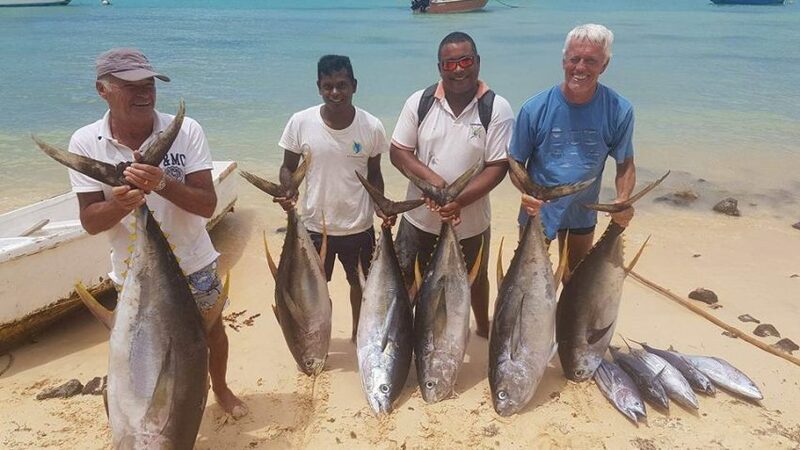 On the Thursday 15 December 2016, Angler Lionel who was spending his holidays in Mauritius, had chosen our Fishing Club (Le Performant Fishing Club) to realized his dream of trying the Big Game Fishing on our Paradise Island. Mr Lionel was also accompanied by his close friend on the boat “Le Performant 1” with Captain Nicolas and Siva as Crew member. An amount of more than 400 LBS were recorded during the weighting process at our embarkation point – Bain Boeuf Public Beach. 2016 will stay a year rich in some very good memories for ”Le Performant Fishing Club” in the domain of Big Game Fishing in the water of Mauritius. One of these good time was the record catch of the club. 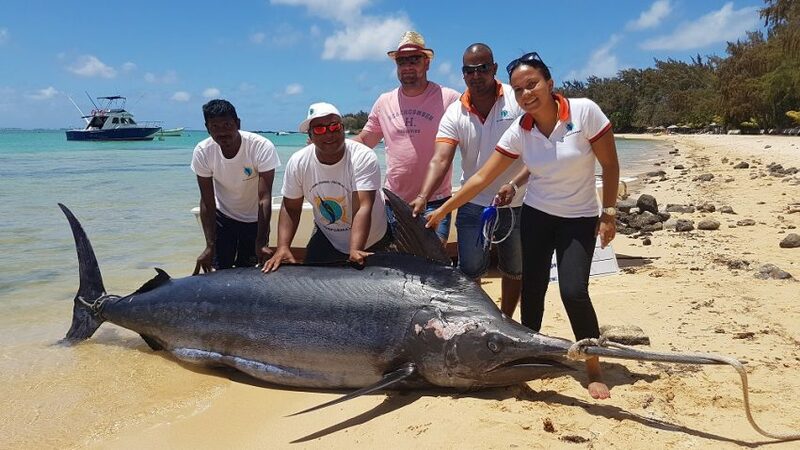 On the 11 of October, the angler Mr Stiaan Van Der Walt and her Wife Azelle Van Der Walt from South Africa who were having their honeymoon holiday on our paradise island Mauritius, caught the 1060 LBS Blue Marlin on our boat “Le Performant 1”.Nicolas was the captain of the vessel and Siva (member of the crew). 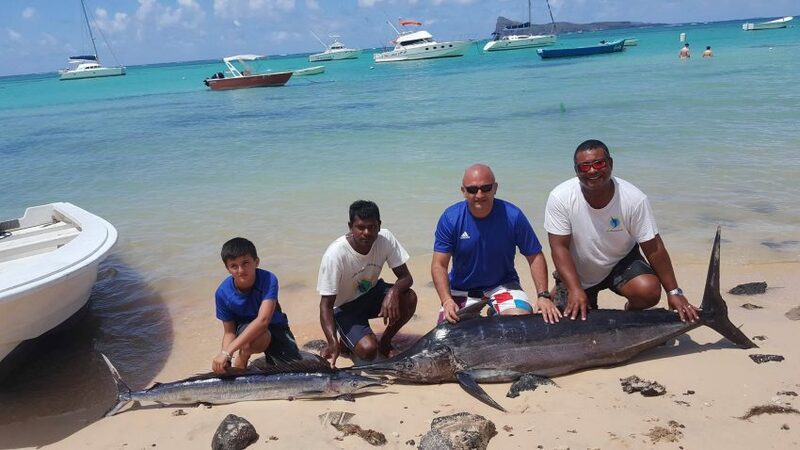 The Permal Family was waiting this wonderful moment for more than 50 years to catch a 1000 LBS fish and luckily was Mr Nimalen Permal (Director of Club, 3rd-generation fisherman in the family) to have this opportunity to live this beautiful club record. Nimalen start his career in the big game fishing since early age and now he has more than 25 years of experience in the sea of Indian Ocean.